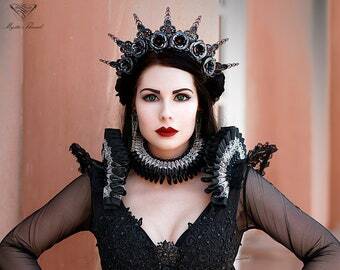 Black lace suspender shoulder pads decorated with black elizabethan ruffs and white Preciosa beads. 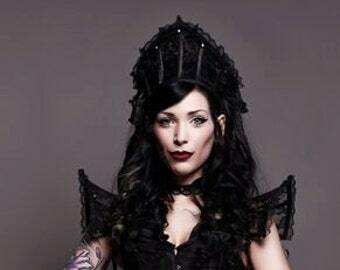 The shoulder pads are made with black fine quality elastic lace, reinforced with spiral steel boning. 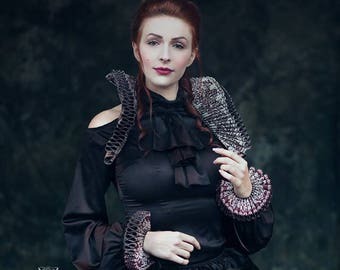 Are decorated with black elizabethan ruffs decorated with black lace details and white Preciosa beads. Are joined with black stretch straps-suspenders. The straps behind have adjustable buckles. 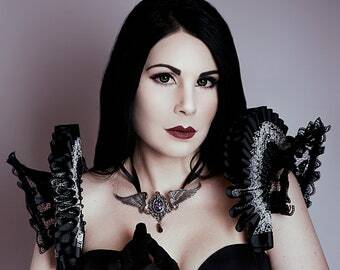 The shoulder pads are fasten with satin ribbon under your armpit and you can tighten them as much as you want. Also, removable chains with clasps on the back will keep the shoulder pads more stable in case it needs. 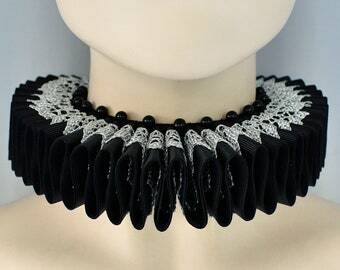 Black Elizabethan renaissance ruff neck collar decorated with black lace details and white Preciosa beads at both sides. 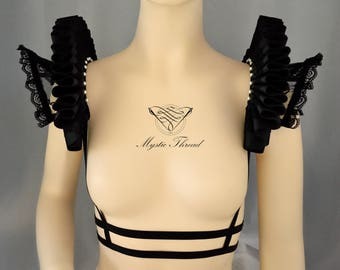 It fastens with satin ribbons on the back. For other color feel free to contact me. There is a possibility that the design of the lace will be a little bit different depending on the availability.